For the millions passing through on their way to California, their image of Nevada is of long, empty roads and dusty desert towns, often little more than a gas station and 24-hour store with a few slot machines in the corner. For those not drawn by the desolation of the desert landscapes, it is fortunate that 'Lady Luck' descended on this state to give hundreds of thousands of people a great man-made reason for visiting. This is casino country, Las Vegas, and the other smaller towns where the main income earner is gambling. Carson, the sleepy state capital, has tree-lined streets and some handsome old buildings and hosts the Nevada State Museum, which covers the geology and natural history of the Great Basin desert: enough distraction for a few hours. Reno is a smaller and less glitzy version of Las Vegas, packed with casinos and pawnshops, and provides easy access to Lake Tahoe, over the border in California. Situated east of California, Nevada is split up into territories such as Cowboy Country, Pioneer Territory, and Pony Express Territory. These adventurous names aside, the majority of the state is a fairly desolate desert, sometimes beautiful, but also harsh and inhospitable. The better land is used for grazing hardy cattle, while the least forgiving is used by the military for weapons testing and other mysterious pastimes. 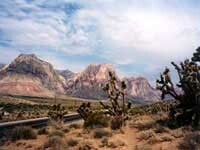 Nevada does have a few scenic attractions of great interest to visitors. Around Las Vegas, Lake Mead is popular with fishermen and water sports enthusiasts. While both the Red Rock Canyon and the Valley of Fire State Park have magnificent desert scenery, which has been used as the backdrop for many famous movies including Star Trek - The Next Generation. The sandstone has been eroded into wonderful shapes over millions of years and at sunset these great natural monuments turn every shade of red.